DUNEDIN, Fla. – Here's another case of baseball justice vs. real world justice. 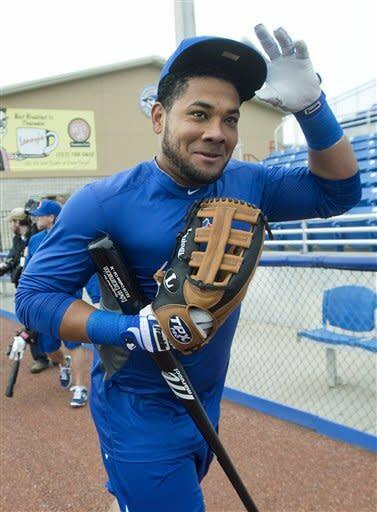 Admitted performance-enhancement drug user Melky Cabrera made his first appearance as a Toronto Blue Jay on Friday morning, refusing to take questions about his PED past. Yet he did take a question about his place on the world champion San Francisco Giants, and he was quite honest. "I feel like I deserve a ring," Cabrera said. "I gave everything to that organization. If they decide not to give me a ring, I'd understand that, too." Wouldn't it feel a little like real world justice if the cheater didn't get a ring? Cabrera said he had no idea if he would get one. He said the Giants have not asked for his size. Then, hours later, the Giants chimed in: "He's getting a ring. We have his ring size," team communication executive Staci Slaughter told the San Francisco Chronicle. "I don't know where that's coming from." Cabrera had an MVP-caliber performance in the first half of 2012 that helped put the Giants on the road to the playoffs before he was suspended 50 games for using synthetic testosterone. In fact, Cabrera's play in the All-Star Game ensured his team would open the Fall Classic at home against the Detroit Tigers. Their Game 1 win over Justin Verlander (without Cabrera, who didn't play in the postseason) ignited a momentum that vaulted San Francisco to a sweep. The World Series could very well have turned out differently if Cabrera wasn't an All-Star. And it could very well have turned out differently if Cabrera wasn't a Giant. That's the very essence of deserving a ring. Was the entire Giants' season tainted? That's a different issue altogether. If so, then none of the Giants deserve a ring. Then we'd have to take hundreds of rings away, across many seasons. But if we're going to crown the Giants champs, we should acknowledge Cabrera's place in their title run. This isn't to absolve Cabrera for his crimes against the sport. His news conference Friday bordered on off-putting. He released a statement before he even sat down behind the microphones, saying he would not discuss his cheating past. He cited as his reason the recent reports connecting him to alleged PED-pusher Anthony Bosch and his anti-aging clinic, Biogenesis. Bosch has also been tied to stars that include Alex Rodriguez, Ryan Braun, Nelson Cruz and Gio Gonzalez. Cabrera has some explaining to do, and he didn't do it. At all. "I am aware that in the past weeks, there have been news articles written about so-called patient files from a Miami clinic, and the MLB and others are investigating those allegations," Cabrera wrote in his statement. "I have told MLB I will cooperate in their investigation the best I can, just as my legal counsel has told federal investigators. I have been instructed by legal counsel not to answer questions relating to the pending investigations. This statement will be the last comment I will make on the events of the 2012 season." Lame. Cabrera danced around the elephant in the room, saying again and again how he had made mistakes and wanted to move on. Easy for him to say. I asked him if he would promise the fans of Toronto and baseball that he will not make any more mistakes this season. "That was a mistake made last year in 2012," he said through Luis Rivera, the Blue Jays' third base coach, who interpreted from Spanish. "He's focused and concentrating on being on the field and playing hard and helping this team win games." After Cabrera was done not answering questions, team GM Alex Anthopoulos entered the room and held his own news conference. He was asked if he was concerned that the Biogenesis ties could get Cabrera suspended again. "Not an issue," he said. "My understanding is that, as of today, we really don't have anything to be concerned with. He served a suspension and right now, that's it. His suspension has been served." Even though another bust would result in a 100-game suspension and deep embarrassment for the GM? 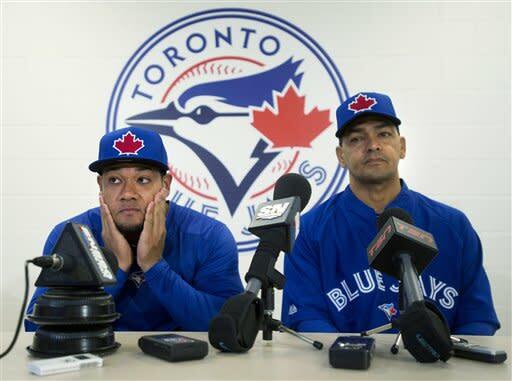 "The way it was conveyed to us, I'm not losing any sleep over it," Anthopoulos said. "I feel very confident." In other words, what's done is done. That's hardly reassuring to those who want the sport cleaned up. It's downright troubling considering the Biogenesis scandal was just uncovered recently and not a single MLB game has been played since it broke. Want more reason to pull your hair out? The Blue Jays debated whether signing Cabrera was the right thing to do. Maybe they should take a stand, and send a message. "What does your organization stand for?" Anthopoulos asked rhetorically. "What's it about?" Maybe the Blue Jays would be strong, and refuse to enable a cheater. Maybe they would say the buck stops here. Maybe they would try to dispense some real world justice. Nah. Anthopoulos went ahead and inked Cabrera to a two-year deal worth $16 million. His justification? He looked at past cheaters and noticed other organizations gave second chances without comeuppance. "It doesn't happen too often that it happens twice," he said. All this makes you want to claw your eyes out if you're a 'tweener who makes the minimum and doesn't cheat – this guy takes synthetic testosterone and gets $16 million? – but there's no karma in baseball. The sport's morals have always been tied to winning and profiting. Cabrera can help the Jays win, and he can help the Jays profit. He's already done so, in fact, as the team has sold out its first home date against the Indians. Cabrera has earned his money without taking a swing. And from reading the tea leaves laid out Friday by Anthopoulos, a 100-game suspension is not in the cards, so Major League Baseball has helped its Canadian franchise both on and off the field. Questionable? Oh yeah. But is depriving an admittedly-remorseful player of a World Series ring going to transform the sport? No. Cabrera has a rich new deal. He has a new uniform. The punishment horse has left the barn. In the often-sketchy world of baseball, Cabrera has paid the price. In fact, he's paid a hefty one. He didn't get to play in the World Series. He didn't get the huge free-agent deal. He didn't win the batting title, and asked Major League Baseball to give the honor to someone else. In the sport's gallery of rogues, Cabrera is on the noble side. He admitted his mistake. He faced the media, albeit in a limited way. He served his time. He doesn't have to answer questions. He doesn't have to give back the new contract. And he won't have to remain without a ring. Real-world justice? Sorry, ain't happening. But baseball justice has been served.